The rusty old canister had been buried for 40 years, but there was something about it that caught the eye of Larry Wright, a 69-year-old resident of Oakland, Calif.
Tim Taylor climbed to this peak, Thursday, August 17, 1972. Age 13 years. Anyone finding this note please write. 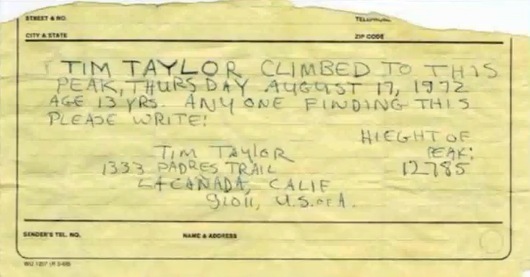 Charmed by the optimism of the note, Wright began a month-long quest to find Taylor. "I had my 14-year-old grandson with me," explained Wright to the Times. "If he wrote a note like that, he'd be interested to have somebody respond decades later." Wright started his search by visiting the home listed on the note and met current owner Koichi Uyemura, who explained that his family had been living in the home for 18 years, reports the Times. Uyemura estimated that his was the third family to buy the property after the Taylors left. He also tried searching voter registration records and Google, but it wasn't until he reached out to La Cañada's local paper, the La Cañada Valley Sun, that he struck gold. The newspaper published a story about Wright's discovery last weekend, and the calls from family and friends started pouring in to Taylor, now a San Diego County Superior Court Judge. In a Valley Sun story published Monday, Taylor explained he was hiking with his Boy Scout troop on the day that he buried the message. He had set out solo to climb the unnamed 12,000 foot peak because it wasn't included in his official Boy Scout map. He also revealed that his father got him into the habit of leaving messages in bottles for strangers to find. Taylor also proposed naming the peak the Taylor-Wright Peak. Becky Satnat, a park ranger for 22 years, said Wright's discovery was surprising and unprecedented, given how small Taylor's note was. "I've never heard of anything like it," she said to the Times. "This does not happen." The oldest message in a bottle was discovered April of this year, when Scottish skipper Andrew Leaper hauled in his fishing nets. The Guinness Book of World Records confirmed that the bottle had spent 97 years and 309 days at sea. It had been released by Captain CH Brown of the Glasgow School of Navigation on June 19, 1914, and the note inside the bottle promised six pence to whoever found it. Check out the La Cañada Valley Sun for more information on what Taylor did after leaving La Cañada. The Valley Sun has also posted Taylor's La Cañada High School year book photo and a more recent one with him in his court robes.